Immaculately Maintained SW Corner 2 Bedroom, 1 Bathroom Condo in PRIME River North Location! IN-UNIT LAUNDRY! Split Bedroom Floor Plan Features Hardwood Floors, NO POPCORN CEILING, Custom Window Treatments & Professionally Organized Closets. Kitchen Features 42" Shaker Cabinetry, Brand New Stainless Appliance Package, Glass Backsplash, Granite Counters & LARGE Breakfast Bar. Spacious Master Bedroom with Gorgeous Sunset Views! Upgraded Marble Bathroom with Two Vanities & Linen Closet. PARKING ADDITIONAL $25K. Assessments Include Bulk Cable Package with Genie DVR Box & Two Additional Cable Boxes, 250MBPS Internet, Water & Amenities - ELECTRIC IS ONLY OUTSIDE UTILITY. 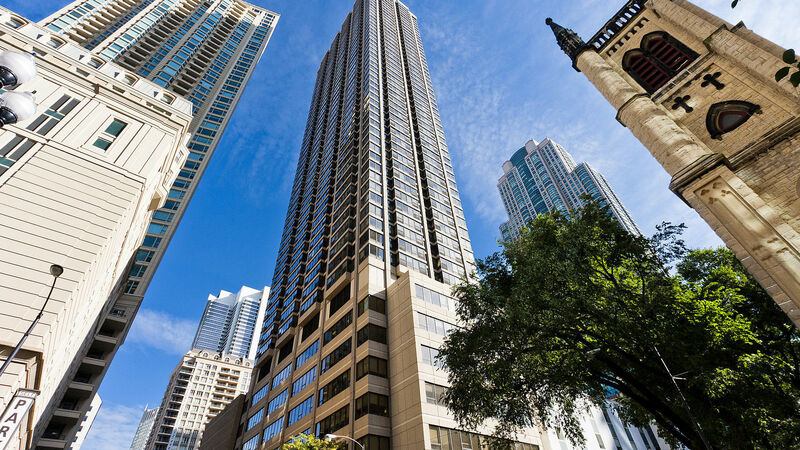 Amenities Include 24-Hour Doorman, 2 Story Sundeck & Outdoor Pool, Comprehensive Gym, Biz Center, Theater & Party Room. RENOVATED SUNDECK & POOL DECK TO BE COMPLETED BY SPRING 2019! Financially Stable Building in A+++ Location!